What keeps me doing this work? Helping people plan for something they often don’t want to accept, face, plan for? Especially since I am not selling anything with proven results. I am not promising something tangible like weight loss or a degree or new found knowledge. I am promising the intangible…peace of mind. I am promising that after you lose a loved one, you may hurt a little less. Your loved one may hurt, anguish a little less after you die. Sadly, most of us that know this gift have already been through a loss. A loss where no plans were made and their loss was compounded. So, why you ask do I keep doing it? Because, for one, I believe in it. I believe it’s necessary just as making sure your retirement assets are well managed or your trip to Hawaii is well planned. And, who wouldn’t appreciate it when your friends send you silly pictures of them trying to read your book? But silliness aside, other than my passion for it, what keeps me going is YOU. When I hear a reader tell her friend how amazing the book is, how well organized it is. When I get an email from someone telling me how easy it is to read and how important the information is. Or, after a workshop when I am approached by strangers thanking me for putting the book together and sharing my message. When strangers tell me they’ve had a meaningful conversation with a loved one after hearing me speak. When a friend tells me she shared with her mom her wish for a certain bracelet when she dies. Or, when Dr. Jennifer Brokaw (daughter of Tom Brokaw, of whom I’ve been a long time fan) likes one of my posts! So, it’s YOU. It’s the countless families I hope MIssing Pieces Plan helps – in small or BIG ways. If you’ve been compelled to start planning or have a conversation because of a post, the book, blog or otherwise, I would LOVE to hear from you. And the best love is a share. Share the book with your family and friends! ​Did you move to LA to write sitcoms? When I first moved to LA and would share stories with new friends about my family, they would all ask if I’d moved to LA to write sitcoms. The stories were that funny, that far-fetched, unbelievable. Worthy of the small screen. So, if it’s family ‘drama’ or dysfunction holding you back from doing your own planning, not to fear. I’ve got you covered. You can’t make others plan, but it doesn’t have to stop you from making your own plans. Ah, there’s a solution for that one, too. I just twisted my own arm and agreed to offer my course online ALL. THE. TIME. But I’m going rogue! This ‘work’ of putting your pieces together is important, necessary, needed for all of us. Sign up. Do it at your pace. Your timing. Get your pieces done. I’m offering every participant a FREE hour with me. I am here to walk this journey together. I’d love to have a one-hour strategy session with you to help you get started. Let’s do this!! Getting the pieces DONE. SOLVED. On Monday and Wednesday I shared the pitfalls we all face when pieces are left missing from our traditional financial plans. What are loved ones are ‘left to figure out’ if we don’t plan. The Missing Pieces Plan is the ONE resource that helps you fill in all the unknowns, all your missing pieces allowing you to plan for the inevitable and gain peace of mind. Download the Checklist (when you sign up to subscribe). Prioritize the 3 “pieces” you want to complete first. I recommend choosing 3 to work on that make the most sense given your stage in life. Calendar time you can spend thinking, dreaming, and creating the life you want. Utilize your calendared time to journaling and write your wishes down for how you want to LIVE and LEAVE your loved ones. After you have a ‘good enough’ idea of your wishes and wants, pick up your copy of the Missing Pieces Plan and complete the worksheets corresponding to the 3 pieces, or chapters, which you chose in Step #2. Get Your Pieces Done, launching in a few days, HERE. The Get Your Pieces Done course will walk you through each chapter and corresponding worksheets to inspire you and help you complete your pieces. With the course, we help you make the time, work the worksheets, AND get your pieces DONE. Before leaving, she pulled out a book she created for her granddaughter. 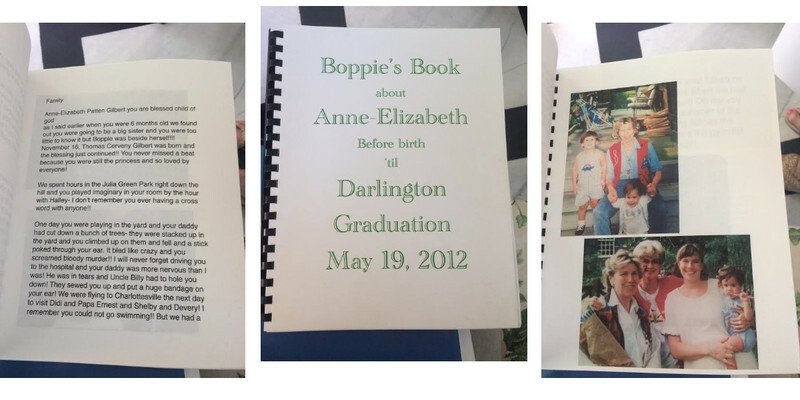 She’s created the same book for all her grandchildren. The book chronicles their lives, includes notes and prayers and overflows with pictures and…love. What a beautiful expression of love to her grandchildren. What I would call a priceless gift. I am sharing Emmy’s books with you today as inspiration. Whether you “go all out” as she has or just simply write a single note. Either way, the gesture is the same. It doesn’t have to be hard or cumbersome. It can be easy to express your love, share your legacy. Get #inspired. Spread #love. Share your #legacy. A lot of Missing Pieces Plan stories I share may not happen to all of us. I know you’re likely tired of me bombarding you with this fun fact. But, here’s the message I want to share with the Missing Pieces Plan… accepting this reality will be a gift. A gift to you and a gift to your loved ones. When we can accept this reality, and realize that WE get to determine how we want to live out the rest of our days and beyond, I believe something clicks. Something clicks in our desire to start dreaming, start planning and take hold of what can be ours to create. I am hopeful that you’ll be excited (yes, I said “excited”) to do this ‘work’. But, why? Why do that? Why, when YOU can be in charge. You can direct the ship. As I have been doing more speaking engagements for the Missing Pieces Plan, I am encouraging listeners to think, dream, and create the life they want BEFORE even picking up my book. Thinking is not something we allow ourselves to do – certainly not in the context of ‘dreaming’ how we want our life to go. But, I am giving you permission. And, a very good reason to do it. By planning how you want your days to go, how you want to leave (because we all will), you can begin to live your FULLEST life now. What would you want that to look like? Everything from belongings passed down to how you want your family financially positioned. What’s important for the remainder of your life? How do you want to spend your last days if you fall ill? How do you want to spend your last days healthy? By planning before a crisis hits, we will be able to live out the remainder of our days on our terms. This month, I hope to #inspire you. You CAN do this. If you think you might need some further inspiration, sign up to receive updates on the Missing Pieces Plan Course, “Get Your Pieces Done,” launching in August, HERE. A few weeks ago, I had the honor of speaking to a group of retired insurance professionals at their monthly meeting. Prior to my presentation, one of my hosts shared a few details of her father’s service with me. It was such a fun story that I asked if she’d be willing to share it with me so, I could share it with you. I am grateful she said yes. Here’s Patricia’s story of her father’s #celebration. May it give you some #inspiration or at the very least, some laughs. My Dad had already gone to the funeral home in Savannah and arranged his funeral and had paid for everything and written his own obituary. He had also been to the cemetery, in Brunswick, GA., which is where he wanted to be buried along with my Mother and his parents and two ex-wives. It was a pretty crowded plot and a very, very old cemetery. He had left instructions of which church to contact for graveside services. The service concluded with that song by Frank Sinatra. And all the family returned to the cemetery, after the luncheon and drank the beer in honor of Daddy…he paid, of course. Want some help with pre-planning your celebration? In the Missing Pieces Plan we have a Guide to help you pre-plan your celebration. Today only, we are giving it to you FREE. Click HERE to get your Guide to Pre-planning your End-of-Life Celebration. 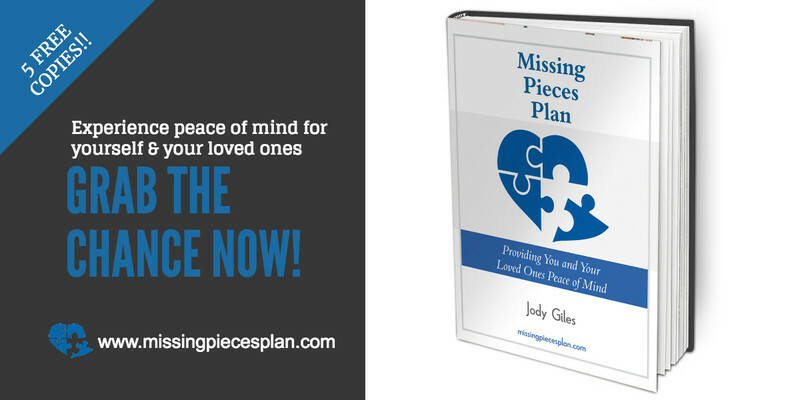 To order your copy of Missing Pieces Plan, click here: http://missingpiecesplan.com/amazon.